Betsy Minton, Shawna Dietrich, Susan McIlwain and Wendy O'Brien made a quick stop in the trade fair during the driving dressage lunchbreak. Photo by Sara Lieser. Where can you find the American spectators at the Alltech FEI World Equestrian Games? Hanging out at the Alltech bar, of course! 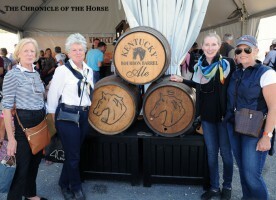 Betsy Minton and Shawna Dietrich of Dietrich Equine Insurance joined Susan McIlwain and pairs pony driver Wendy O’Brien for a quick stop for some libations before continuing their trip through the amazing trade fair. While Dietrich and Minton are combining work with pleasure, as there are a few Dietrich Equine Insurance clients at the World Games, McIwain was just enjoying being a spectator, and O’Brien was excited to cheer on her fellow drivers, especially Lisa Stroud, who joined her on U.S. world championship pony teams in 2011 and 2013. What did you come to watch? Did you make it to the eventing cross-country? What’s been the best thing to watch? Have you gotten to do some sightseeing in addition to watching the World Games? “We went to the American museum at the memorial. That was extremely moving. Omaha Beach was breathtaking. It left us speechless. We’ve been meeting lots of interesting people at the World Games—check out a pony who thinks he’s a lion and his amazing trainer, the family that came from Great Britain to support two different nations and find out what it’s like to work at the trade fair during a major competition. Stay informed with the Chronicle’s online coverage! You can find all the stories on our main World Games coverage hub.